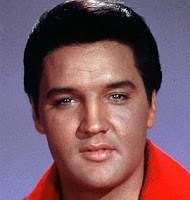 As noted in the previous post, VOA music reports in the first two weeks of 2010 focused on what would have been Elvis Presley's 75th birthday, as well as the deaths of Sandro, known as the Argentinian Elvis, and the hugely popular Teddy Pendergrass. Doug Levine produced an extensive radio feature on two major celebrations conducted in observance of Elvis' birth, which took place on 8 January 1935 in Tupelo, Mississippi. The first was at the Rock and Roll Hall of Fame in Cleveland, Ohio, where two days of special ceremonies, "75 Years of Elvis", will honor the legendary singer. Graceland, Elvis' longtime home in Memphis, Tennessee, and a place of pilgrimage for hundreds of thousands of admirers ever year, mounted a special commemoration entitled "From Tupelo to Memphis." VOA also carried a news report on Presley's grandchildren, Riley Keough (left), and her brother, Benjamin (right), cutting an enormous birthday cake in a special ceremony presided over by Presley's widow, Priscilla. And Phil Mercer reports on the annual Elvis Festival in Parkes, New South Wales, Australia, with an expected attendance of 10,000 or more, with many dressing as Elvis or Priscilla. Mercer says that "the Parkes festival began in a small restaurant more than 15 years ago . . . [and] has grown into a five-day event that includes dozens of concerts and look-a-like competitions as well as an Elvis-themed gospel church service and a street parade." On an oddly related note, a VOA news item reports that "the Argentinian Elvis", the singer and film star born as Roberto Sánchez but popularly known as "Sandro", died on 4 January at the age of 64 in the city of Mendoza, Argentina, from complications following surgery. Further details may be found in obituaries in The Christian Science Monitor, which observes whimsically in its headline that "Argentina's 'Elvis' Sandro has left the casa", referring to the popular catch phrase, Elvis has left the building", that originated at Elvis concerts to prevent overenthusiastic fans from remaining in the concert hall in hopes of an encore; The Independent, which mentions that Sandro "was the first Latin singer to play Madison Square Garden and one of the first rock-and-roll singers to be greeted on stage with a barrage of flying underwear"; and The New York Times, which reports that as lead guitarist for the popular band Los de Fuego, during one performance in the early 1960's, "when the group’s lead singer lost his voice. . . . Sánchez relinquished his guitar, took over singing duties and began dancing to the rock rhythm. The crowd went wild." The superstar's passing was mourned by tens of thousands of admirers as he lay in state for 24 hours, and as his hearse passed through the city of Buenos Aires. Several videos of his performance of "Rosa, Rosa" (among other songs), in full Elvisian garb, confirms the comparison, and can be seen on YouTube. Finally, Doug Levine produced an obituary on Teddy Pendergrass, one of the leading singers of Soul Music, who died in Philadelphia on 14 January at the age of 59. Pendergrass' career was noteworthy for the fact that, despite a near-fatal automobile accident in 1982 in which he was paralyzed from the waist down, Pendergrass returned to perform in a wheelchair in a continuation of his previous success. In addition to his dozens of recordings, he released his autobiography, entitled Truly Blessed, in 1998. Remember Honey Love by Clyde McFadder and the original Drifters? My sister had that on 78 rpm back around 1954 or so. Touched my soul just like flamenco.